The New Year is upon us! Like many of us, your New Year’s resolution is probably centered on self-improvement. Whether you plan to eat healthier, commit to an exercise regimen, or simply devote more time to others, New Year’s resolutions are a great way to renew your focus and become a better version of yourself. If you are in search of a resolution that you can keep, Annapolis dentist Dr. Djawdan would like to offer a simple solution: be kind to your teeth! Your teeth are not only aesthetically important, but good oral health is critical for total body health. 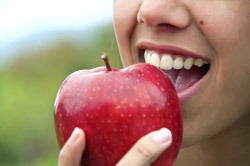 Making a renewed effort to improve your oral health can be as simple as tweaking your diet to avoid foods that can be harmful to your pearly whites. Not convinced? Consider this… because these offending foods are sugary and high in calories, making these tiny adjustments in the foods you eat will not only keep your teeth in tip top shape, but it could also help you reach your fitness and wellness goals as well! Hard candies are full of sugar and can even trigger a dental emergency such as a chipped or cracked tooth. Yikes! Ice. This may seem counterintuitive since water is vitally important, but chewing on ice can cause cracked enamel. Do yourself a favor and stick to water in its liquid form! We at the Djawdan Center understand that the foods listed are indeed delicious and may be difficult to avoid entirely, but remember to brush and floss diligently if you do decide to indulge! Dr. Djawden and his staff want to you keep you smiling with healthy teeth! Contact us for more information on Restorative and Sedation dental services we offer in Annapolis Maryland.